If you’re a regular at Knife Informer then you’re probably familiar with the Spyderco Para 3. You may already have one by now, and you likely witnessed some of the hype that surrounded the arrival of the Para 3. Originally referred to as the Para-Military 3, and then rumored to be called the Minuteman, the Para 3 is essentially a shrunken down Paramilitary 2. In some ways this is a good thing, and in other ways it’s not. Now that the excitement and anticipation has settled down and the Para 3 is here in the flesh, it’s time to dig in and examine it. Is it the all-time great EDC blade that everyone hoped it would be, or is it more of an underwhelming disappointment? First, let’s get something out of the way. 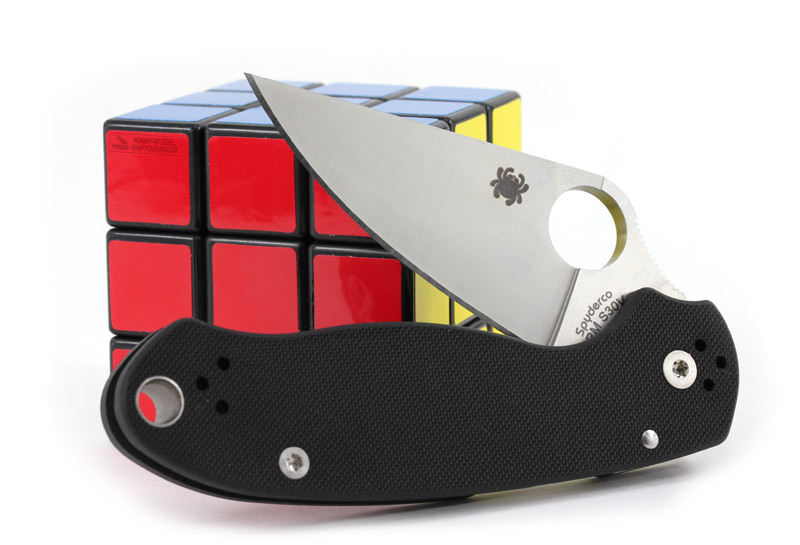 While the Para 3 is basically a shrunken PM2 it would be incorrect to refer to it as the “PM3”. Why? Well because Spyderco said so. Our friends over in Golden, Colorado have been very clear since launch that the Para 3 was not named the “Para-Military 3” because its smaller size puts it in a different design category. Further, they point out that the “3” in the name should not be assumed to refer to a third-generation Paramilitary – instead it refers to the 3-inch blade on the Para 3. So, while it clearly carries Paramilitary DNA, Spyderco really wants you to think of the Para 3 as having an identity all of its own. Nothing particularly surprising here. The blade is 3.0” with a 2.62” cutting edge per Spyderco’s specifications, versus the PM2’s 3.44” and 3.00” cutting edge, which means it’s legal to carry in places that restrict legal blade length to under 3” – like Chicago. The blade shape is a clip point with a straight spine, full flat ground from CPM S30V steel – the same as the PM2, but shrunken down in length so the blade more resembles the flat ground Delica 4 in proportions, at least to my eyes. It’s satin finished and has the same oversized thumb hole opener as the full sized PM2 for deployment. 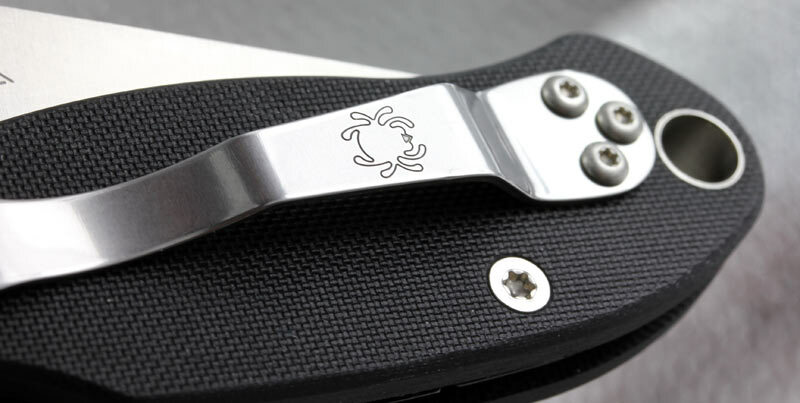 Another modern Spyderco hallmark, the forward choil, is present here to allow the user to choke up forward on the blade as well as assist with sharpening. Like most US-made Spydercos, the grinds are clean and even and it came very sharp out of the box, easily push cutting paper or shaving hair. Being full flat ground with a needle point tip, the Para 3 is ideal for the sort of mundane everyday carry tasks that require precision and control, like opening packages or food preparation (where the high corrosion resistance of S30V comes in handy) and it’s designed to be a more manageable size for day to day use than the PM2. No complaints here. It’s a compression lock Spyderco with an oversized thumb hole opener – which is the long way of saying that deployment and lockup are great. My reviews sometimes come off as “Spyderco fanboy” and I’ll take that accusation – there are some things they just do right, and the compression lock is one of them. Working like an inverted liner lock, the compression lock is actuated along the spine and locks the blade in place by putting the lock bar in between the blade tang and the stop pin. You have options when it comes to opening the Para 3: rolling open or coin flipping with your thumb works great, as the trailing edge of the forward choil doesn’t get in the way of your thumb. You can flick it open with your middle finger from the back (my preferred method), and you can also hold the lock and snap the blade open with your wrist. 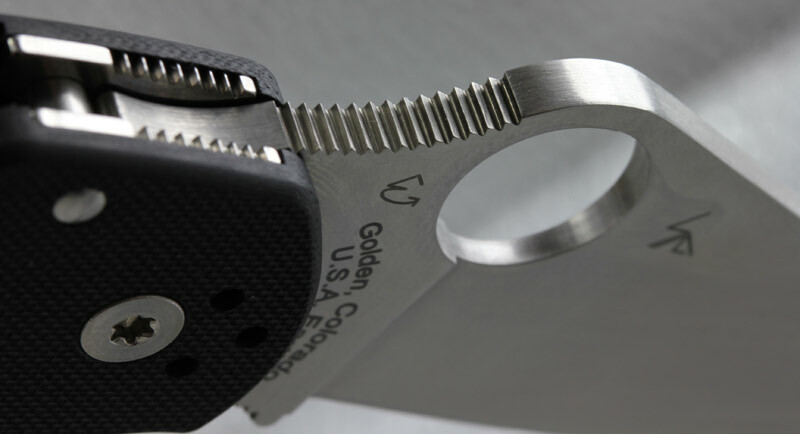 Phosphor bronze washers and Spyderco’s smooth “bushing pivot” design – where the washers are located between the scales and a small shoulder on the pivot pin itself – ensure the blade opens with little drama. Side to side blade play is minimal but present, a disappointing eventuality of these pivot bushing systems. Since tightening the pivot screw pulls the entire assembly together rather than just tightening straight down on the washers, you can’t actually tighten all of the blade play out. This is more of an irritation to the knife enthusiast than a practical concern, but it’s worth mentioning. Another thing I’ve noticed about the Para 3 – owing to the lighter weight of its blade versus the PM2, it can be harder to successfully close it in one fluid motion since the blade is more prone to sitting on the detent ball, leading to a “flip closed and then close it all the way” motion that’s the knife equivalent of stalling your Mustang repeatedly in front of all your friends. Maybe this will get better with long term break in but it didn’t improve with weeks of pocket carry. Here’s where the plot begins to fall apart. Let’s talk about the elephant in the room: the Para 3’s pocket clip is terrible. Actually, to be accurate: it’s the same as the Paramilitary 2’s pocket clip, and it’s been stuck onto the Para 3 as an afterthought. On the Paramilitary 2, the tail of the handle is wider at the end, so there’s enough width to place the lanyard hole next to the pocket clip. The pocket clip is angled upward towards the compression lock, which moves the bulk of the handle towards the edge of your pocket, minimizing the space it takes up in your pocket. For some reason, the Para 3 doesn’t have the flared tail end of the PM2, so the clip is mounted above the lanyard hole rather than next to it, further up the handle. This has two unfortunate downsides. First, more of the knife sticks out of your pocket, which is hardly ever a good thing. More knife sticking out of your pocket means it’s more noticeable to other people, which could raise the wrong eyebrows. Secondly, and more importantly, with the clip sitting smack dab in the middle of the handle it is almost immediately uncomfortable to actually use the knife, creating an instant hot spot in the center of your palm that doesn’t exist on the PM2. With the Para 3, you are constantly aware the clip is pressing into your hand, whereas with the PM2 you forget the clip exists in the first place. This is a forehead-slapping oversite on Spyderco’s part. Thankfully if you’re really attached to the PM3’s design you can fit it with an aftermarket deep carry clip – like this one from Lynch Northwest, a titanium deep carry clip that fits a variety of mainstream Spyderco’s. It’s only $18 but as we talk about later in this review, that makes even less sense. It would also partially occlude the lanyard tube as well. Maybe a deep carry wire clip would solve the issue, but moving the lanyard hole further out and down the spine and moving the clip mounting screws up towards the tail end would go a long way towards fixing this problem. But poor positioning aside, the clip is still oversized for the Para 3’s diminutive frame. Another curious difference between the PM2 and the Para 3 is the stop pin. On the PM2, it’s adjustable – a threaded tube with a screw – which is useful for properly setting the pivot tension. I’ve always found the trick for a happy PM2 is to evenly tighten the pivot itself all the way down evenly on both sides, then loosen the stop pin itself a hair to eliminate binding along the axis of the frame, allowing for a free-dropping action with the lock held open but virtually no blade play when open. The Para 3 ditches this for a simple press fit pin, eliminating this adjustment option for tinkerers like myself. The rest of the Para 3 is what’s expected of high end Spydercos, which is to say that it’s quite nice to those that know the difference, and people that aren’t informed will assume it’s a cheap knife. There’s no contoured titanium, colorful backspacers, or flippers and bearings here. The black G10 handles have more of a soft radius to their edges than the PM2 making the Para 3 comfortable in hand. There are four positions for the clip (and none of them are ideal.) The pivot and body hardware is polished and sits flush with the scales when tightened down – except the aforementioned pivot pin. The lanyard hole, which is in the way, sports a slick stainless barrel that is press fit into the scales and serves as a structural element of the knife. The Para 3 uses skeletonized nested stainless steel liners for strength and weight savings, and indeed the knife has a very solid feel in hand considering its light weight. Fit and finish is perfect. This is a domestically produced knife from a reputable company and frankly anything other than perfect at this price point wouldn’t be tolerated, but it’s worth noting that Spyderco can still crank out a knife that’s absolutely free of production or manufacturing flaws. The grinds are even, the scales line up, the blade is perfectly centered when closed, and the compression lock operates without any stick. The satin finish on the blade is even, and there’s no evidence of tooling marks or anything of that sort. Other than the stop pin standing proud of the scales, everything on the Para 3 gives the impression of a product assembled by people that really care about the work they do, which is a nice thing. As mentioned previously, the Para 3 just isn’t a comfortable knife in hand. The grip, at least with the clip configured in the tip down right hand configuration that the majority of users prefer, creates a hot spot in your palm when you use it for any extended period of time. This is disappointing and paints a negative light on the usage impression of what would otherwise be a pleasant knife, although I suspect it would be much better with an aftermarket deep carry clip or a redesign of the positioning of the lanyard hole and pocket clip mounting screws. It cuts well, though. Full flat ground Spydercos that cut well shouldn’t be a surprise to anyone. The factory edge is great, and the geometry of the blade allows it to slice through things with ease. The smaller blade size versus the PM2 is a matter of opinion – I think the sweet spot for daily use is right around 3.5”, so for me the Para 3 is a little on the small side, but some people prefer sub 3” blades for EDC use as they lend themselves more naturally to detail oriented tasks. The forward choil is great for a choked up grip, and this application of the compression lock is fantastic, and nearly identical to the PM2. The more rounded edges of the Para 3 are one feature I hope migrates over to the PM2, a small change that seemingly makes a big difference to in-hand comfort, if you’re ignoring the uncomfortable pocket clip. Thumb jimping on the spine is well placed, locating your grip strongly, and the curvature of the underside of the handle matches up well with your fingers for a comfortable grip. At this point most knife users are pretty familiar with Crucible CPM-S30V, which used to be one of the most well-regarded super steels on the market. It’s since been left behind by a wave of even higher end steels, but S30V is still a great steel for the price. Compared to its newer brother S35VN, it’s slightly more brittle and a tad harder to sharpen but its edge holding abilities are about on par. It’s no S110V, but it’s still a great steel. Good news for Para 3 fans: the eventuality of upgraded steel and sprint run versions of this knife is about as inevitable as death and taxes. I personally look forward to a blurple/S110V variant, or maybe CTS-204p/M390/CPM-20CV. And who wouldn’t like a Para 3 in natural Jade G10 with CPM-M4? The elephant in the room? The Para 3 retails for $119 on BladeHQ in standard black G10/satin blade format (the only version currently available.) The Paramilitary 2 in the same configuration is $125 from BladeHQ. Is the Para 3’s shorter blade, annoying clip placement, and non-adjustable stop pin worth saving $6? Not for me. If you want to correct the clip issue with a titanium deep carry clip you come out $12 more expensive than a PM2 that doesn’t need it in the first place. If you want a 3” Spyderco with a full flat ground blade, a compression lock, S30V steel, a forward choil, and all the other things that make it worth waking up in the morning to deal with another day on this earth, why not buy the new Sage 5? At about $140 it’s ~$20 more expensive, or basically what it would cost to slap a Lynch clip on a Para 3! It also has carbon fiber laminated G10 scales and a deep carry wire clip. You can snag a Sage 1 for about the same money with a liner lock if you prefer, or the bolt action lock Sage 3 for $160 if you fancy a different lock. The leaf shaped blade is more reminiscent of the Manix 2 than the Paramilitary series, but still a fantastic slicer. There’s also the long-running Native series in Lightweight format with S35VN steel for about $85, or in CPM-S110V for $116(!) and even Maxamet Micro-Melt for $143 if you never want to have to sharpen your knife again. Unusually, Benchmade doesn’t make much that directly competes with the Para 3 on price. As far as size, the Para 3 is comparable to the well-known Mini Griptilian with its 2.91” blade. The standard hole-opener Mini Griptilian (model 555HG) is my preference over the thumb stud variant, with its unique sheepsfoot blade shape compared to the thumb stud model’s drop point. Noryl GTX (plastic) handles and 154 CM steel are a step down from the Para 3’s G10 and S30V, and the standard Mini Grip’s ring in right around $95 or so. There are the new upgraded Griptilian models with the -1 prefix, featuring grey G10 over stainless liners, blue backspacer barrels, and premium CPM 20CV steel. The hole opener 555-1 comes in well over the Para 3’s price tag at $165, but are extremely well regarded by those who own them. The Benchmade 485 Valet series is also similar sized – with a 2.96” blade – but the Bohler M390 steel and Benchmade’s “aggressive” pricing places it a solid $50 above the Para 3 at $170 retail. The Nakamura 484 is another gorgeous knife that’s around the same size – a 3.08” M390 blade – but a retail price of around $190 is even further out of the ball park. The closest thing to the Para 3 comes from Benchmade’s popular hunting line, the G10 handled 15031-1 “North Fork” axis lock folder. With a 2.97” S30V blade and a $140 price tag it bears consideration if you’re an axis lock fan. Less mainstream options are available if you look. Boker makes heaps of interesting knives in this price range, frequently with well-known designers. The Boker FR is a Brad Zinker designed framelock with skeletonized handles and a hollow ground drop 2.9” point VG-10 blade that flips on bearings for about $100, and weighs only 2 ounces. Finally, if you haven’t tried anything from Kizer yet, the 3” market is a great place to start. There is a plethora of options around this size at varying price points. Kizer’s new Vanguard line of low-priced designs rendered in G10 handles and VG-10 blades offer extreme value for money and predictably fantastic flipping action. With designs by Matt Cucchiara, Kim Ning, Michael Vagnino, and Ray Laconico all under $100, there’s more than enough choices to keep you busy for years. It’s hard to overlook your biases when reviewing something that’s been eagerly anticipated by enthusiasts for months or even years. We’ve been hearing rumors of a shrunken PM2 for years now, with the fervor surrounding the topic almost approaching sneaker territory. It’s hard not to be disappointed by what ends up coming off as a half-baked effort ergonomically, struck down by something so hard to screw up as a pocket clip, and rendered a difficult logical purchase by its close financial proximity to its (ergonomically superior) bigger brother. 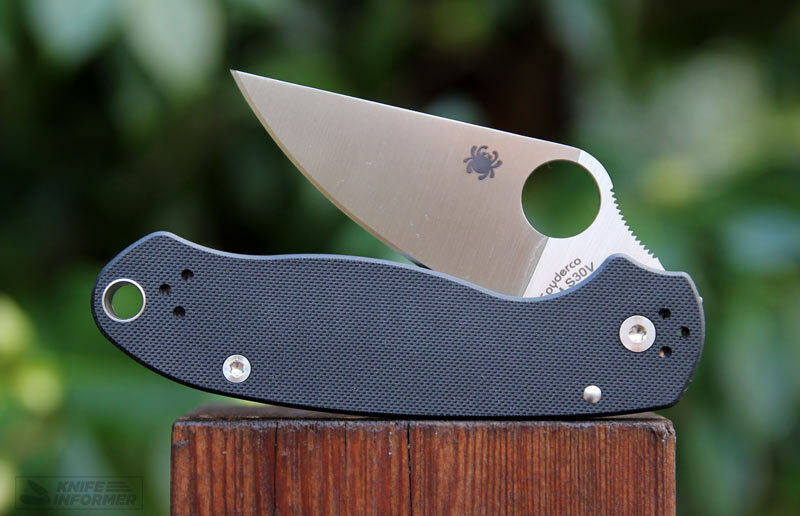 The fact that it would cost more to remedy the faulty clip design than it would to just buy a PM2 or a Sage 5 makes it hard to whole-heartedly recommend the Para 3. It’s not to say that the knife is a total failure – it has a fantastic lock, great blade geometry, good fit and finish, and it cuts well. It’s just that the Paramilitary 2 does all these things better for an additional $6, and while I don’t know what your time is worth, I probably waste more than $6 a week incorrectly calculating the tip at restaurants. I guess if your standard of measurement for the Para 3 is “is it a smaller PM2?” then it’s a success. It’s a shrunken PM2 with a bad clip. 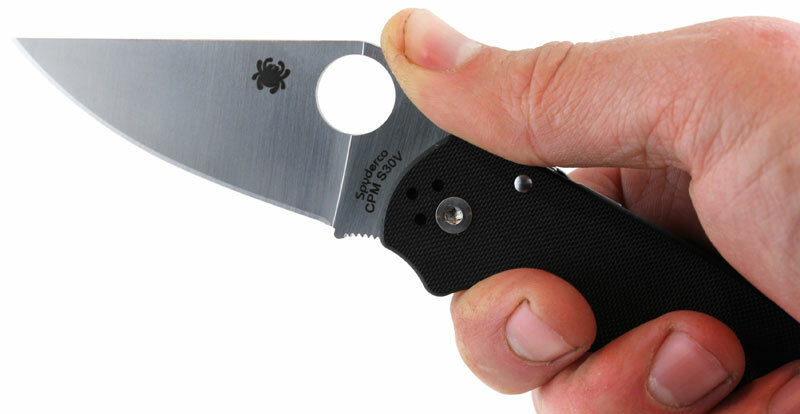 But frankly, I’m not sure I get the point of shrinking down a design that emphasizes packing length and performance into a light and thin package in the first place; the Para 3 ends up butting heads with knives in the same size range in Spyderco’s own lineup that were designed from the get-go to be 3” folders, rather than shrunken down to fit. “But I really want a PM2 that I can legally carry in my jurisdiction, which has penalties for blades over 3 inches!” That may be the case, and I get that, but from Spyderco alone the Sage series and the Native 5 both do a better job of being a 3” (or sub 3”) daily carry knife than the Para 3 does, and in some cases even for less money with better steel – like the Native 5 Lightweight. I suppose it’s a sign that we’re living in the perfect age of knives when we can be this critical of a knife like the Para 3, which fits the hand well, cuts like a light saber, is made in the USA and will last for years and years. However, to achieve success in this overcrowded segment you need to bring more to the table than a shrunken version of a popular design with some questionable ergonomic choices and a high price tag. You won’t be mad if you buy one, but there are better choices on the market. You wanted a smaller PM2 - you got it...but somehow it leaves us wanting more. Consider a Sage 5… or a PM2 if it’s not a legal issue.